We’ve been using freebie plastic protectors on the prongs of our 15 Amp shore power plug, but we keep on losing them and the plug is beginning to corrode from the gunk that gets sprayed on to it underneath the van. We found a squeezable storage container called a ViewTainer. When you squeeze the sides, a slit in the top opens up. When you release, it closes again. The container is meant for storing small items like screws, but it works really well for our plug. Often you’ll find little plastic protectors on the plugs of new electronics. We’ve been saving a stash of them to use on our shore power cable to protect the plug prongs. 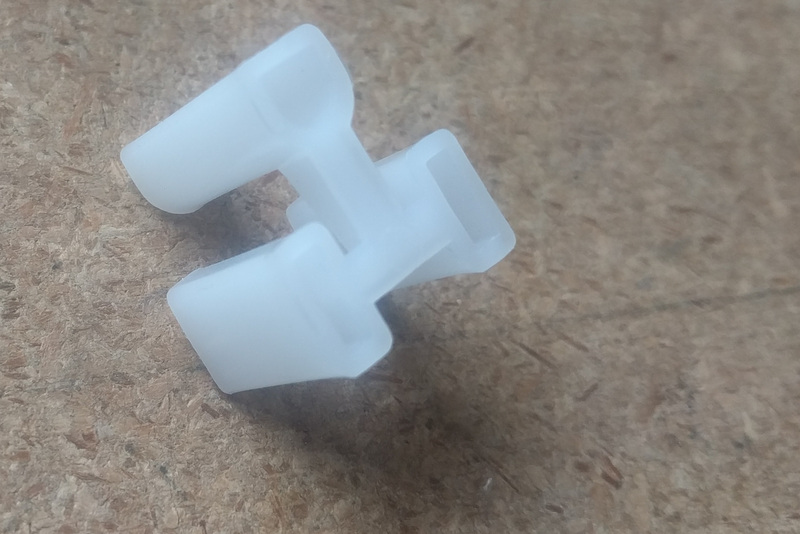 The plastic protectors that come attached to some consumer device power cables. The thing is, they fall off while we’re driving and we also lose them when we take them off to charge the van up. So we needed a better solution. If we’d been smart, we’d have found a small plastic container with a screw-top lid, and threaded the cable through a cable gland attached to the lid before we threaded it up inside the van’s rocker panel. Then, we could have easily unscrewed the container from the lid every time we wanted to access the plug end. The “ideal” solution to keeping the plug ends clean – a cable gland through a bottle lid, so the bottle could screw on over the plug end. I mocked this up on the workbench to show the idea. We already threaded the cable through into the van, so we can’t retrofit this solution. But we weren’t smart enough to think of this before we threaded the cable into the interior of the van. So we had to find an after-the-fact solution. 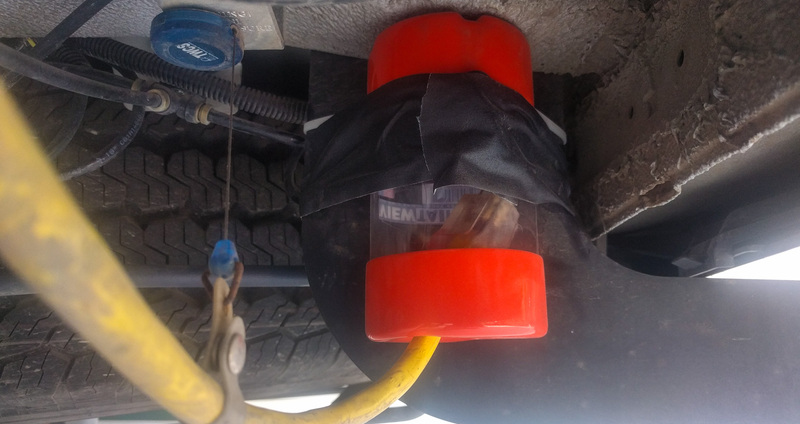 We zip-tied a 2.75″ x 5″ ViewTainer to the edge of the hitch mount bracket. We gave it a wrap of gaffer tape as well because the container is soft and squeezy and we weren’t convinced the zip tie would stay put. ViewTainer used to hold 15A plug and keep it clean and dry. The container has a slit in the lid, so we turned it upside down. It’s easy to feed the cable into the slit. if it does get wet inside, the water should just drain out. The plug stays put very well. 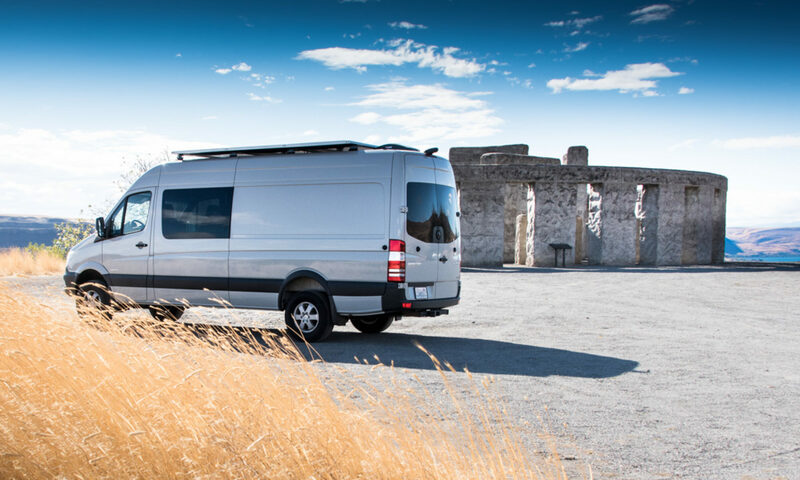 We wish we’d bought black rather than orange, because it does catch your eye sticking down a little at the rear of the van, but apart from that it’s a great way of keeping the cable clean. Not sure how often you plug into shore power but we mounted a port plug (link below) to the underside and keep our extension cord inside with the tools to plug in when we need it. This way we also have an extension cord free for anything else that may pop up. Plus, it’s black! Noah, thanks for that link! We also use an extension cord. That cable under the van is just a short end of an extension cord that we cut off. It threads inside the rocker panel and up to our distribution panel. We did previously have the cord hidden away inside the rocker panel under the rear of the van, but after we installed our air compressor and tank we lost access to that space. It’s been dangling outside ever since. Next PostNext How corrosive is DEF fluid, anyway?